In this issue: John Ellsworth's article provides six tips to help athletes be more mentally prepared. An excerpt from Brian Gotta's book Winning Secrets will help you turn players into team players. And Olan Suddeth comes through again, this time with advice on correcting "superstar" behavior. Due to popular demand we again offer your league's "to-do" list BEFORE Opening Day: If you discuss these eight items BEFORE the season begins, you may save a lot of aggravation later. Looking for pre-season practice tips? Eager to have the team at its best for Opening Day? Get a copy of Brian Gotta's Winning Secrets. Please visit our sponsors: Beam Clay is the source for all your field needs and much more. Web Gem Glove Care lets you break in and maintain the shape of that new glove. The Bench Coach is a way for your league to install inexpensive, professional style helmet and bat racks in any dugout. WheelHouse wants you to have a portable batting cage in your back yard. Secrets your pitching coach won't tell you? The 90 MPH Club has them. Need to order your league's pitching machines, tees, and accessories? Jugs Sports is still the best choice. SportsSignup provides online registrations at a fraction of what you may now be paying. HotGlove lets you break in that new mitt in minutes - the professional way. 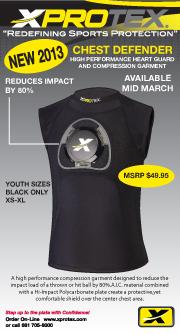 XProTex's newest protective offering is the Chest Defender. And, keep arms strong and healthy with J-Bands.